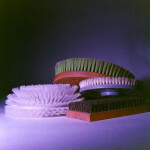 Punched-in brushes (sometimes called Staple set brush or Punched knot brush) are where the filament is stapled in tufts into pre-drilled holes on the brush body made of plastic or wood in a near limitless range of shapes and sizes but most typically rollers, discs, flat pads or blocks. Due to the more diverse choice of body shapes, bristle patterns and configurations, punched-in brushes are a popular alternative to hand drawn brushes or strip brushes and wrapped roller brushes where more specific and custom applications are required. Punched knot roller brushes are more suitable to applications where a less dense brush may be required than a wrapped roller brush as the tuft pattern can be configured both around the circumference and down the length of the body. 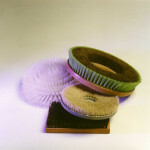 Punched-in brushes are mostly used in cleaning where they are a popular choice due to the custom shapes, sizes and configurations and ability to be designed to the customer’s end requirements. Other applications include; material handling, water treatment, polishing & deburring, food processing, label application, and product supports. Widdops manufacture custom punched-in brushes with flat pads and rollers, designed according to our customer’s requirements. We are also not as limited to a width of brush which means, for example, that we can supply a brush in sections up to 3 metres long by 500mm-metre-wide and a trimmed filament length of 400mm. 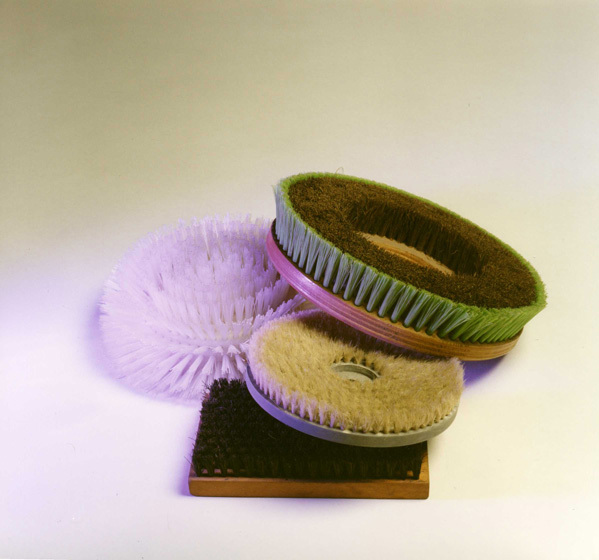 As with strip brush and hand-drawn brush, most filaments are available as filing material. To discuss your requirements and Widdops’ industrial brush solutions, please contact us.